A man and a woman burst out of a dark house in the middle of the night, with two attackers hot on their trail. The man survives, but the woman isn’t so lucky. She meets a grisly end, and a hooded figure - looking like a KKK member with a triangle sewn over his face - watches from the shadows as the assailants set off after the man. 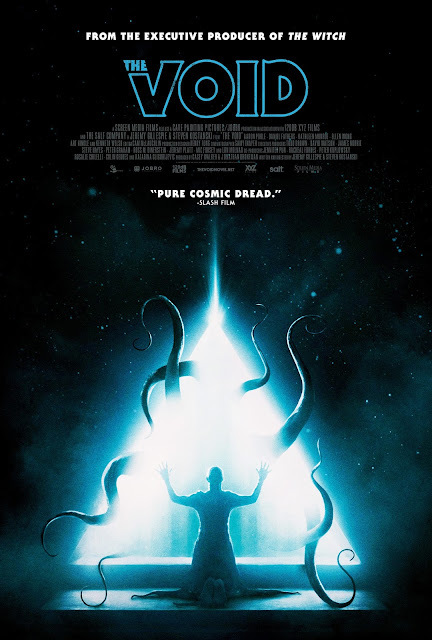 The Void goes on to follow Daniel Carter, (Aaron Poole) a police officer who takes the survivor to an on-the-verge-of-closing-due-to-fire-damage hospital. Once there, Carter must deal with insanity, murder, cultists (the hooded figure has quite a few friends), and otherworldly monsters. The stylish and Lovecraftian The Void seems like someone put the films of John Carpenter and Clive Barker in a blender and then tried to strangle you with the power cord (in a good way). You’ll sense elements of Carpenter’s The Thing and Prince of Darkness and Barker’s Hellraiser (I think there’s a scene late in The Void that’s a direct homage to a bit in this film) and Lord of Illusions. A good story unfolds in The Void as well, something that can get lost in a movie like this in favor of zaniness for the sake of zaniness. In fact, there’s prequel-levels of backstory hinted at in the film, something lesser films wouldn't make time for. But don’t get me wrong, there is definitely zaniness. There's a great atmosphere, thanks to the nearly abandoned hospital and the creepy woods surrounding it. There’s plenty of weird, bloody, and spacey visions to be had, and there’s some great creature effects on display. The Void boasts some very unique horror and gross-out images that are guaranteed to stay with you after the film ends. Writers/directors Jeremy Gillespie and Steven Kostanski have extensive backgrounds in art and makeup, so it’s no surprise the visuals here are great. I also noticed some stellar sound design happening - creatures sound both like monsters from another world AND the poor folks they’ve sprouted from. And the third act features the film’s hospital setting sounding more like our heroes are on a creaking ship that’s about to sink into the mouth of hell. Every actor in the film is solid, with Poole standing out particularly as a man in completely over his head as reality turns on him. Kenneth Welsh also shines as a doctor and leader of the hospital's skeleton crew. If I can fault the film for anything, a specific theme of loss may have been used so much that it somehow gets confusing. But the movie more than makes up for this with its visuals and atmosphere. The Void is playing at Sun-Ray Cinema as part of their Sleeping Giant Fest. The film screens at 9:10 p.m. on Friday, March 31 and 9:40 p.m. on Saturday, April 1.